Since we have published In Time for Tomorrow we have had a number of enquiries about running Carbon Conversations in other countries. In principle, with the right support, it should be possible to take the UK materials and use them in other places. You will see on the new materials page that there are a number of other materials available (Facilitators Guide, Work books and games.) to people running groups that could make it possible to start a group in another country. However, apart from any language issues, there are a few problems that go beyond picking up the UK materials and rolling them out in a new location. 1. Adjusting the materials to the local circumstances. The book and the ancillary materials were developed for the UK. Once you have read the book or looked at the calculator you will see that to run a group in another country using the information in the book uncritically would be quite misleading! We have suggested that people could run a pilot group to discover how much needs to be changed. I can see a number of issues that need some thought before starting any group. Both total per capita emissions and the proportions between home energy, travel, food, consumption and infrastructure vary from country to country and state to state. Our Carbon Calculator uses UK statistics and asks questions specific to the UK. We don’t ask questions about air-conditioning and make assumptions about typical diets. Advice on emissions reductions are also UK based. Each of the four main areas of carbon emissions will need adjustments to both the figures and advice given. For example, the section on Energy In The Home assumes a rather poor state of the UK building stock. All the references are to UK sources of advice and you will need a list of equivalent organisations in your area. Competent scientific or technology researchers will be needed to fully adapt the materials for another country. It should not be underestimated the scope of the work to make all the changes. 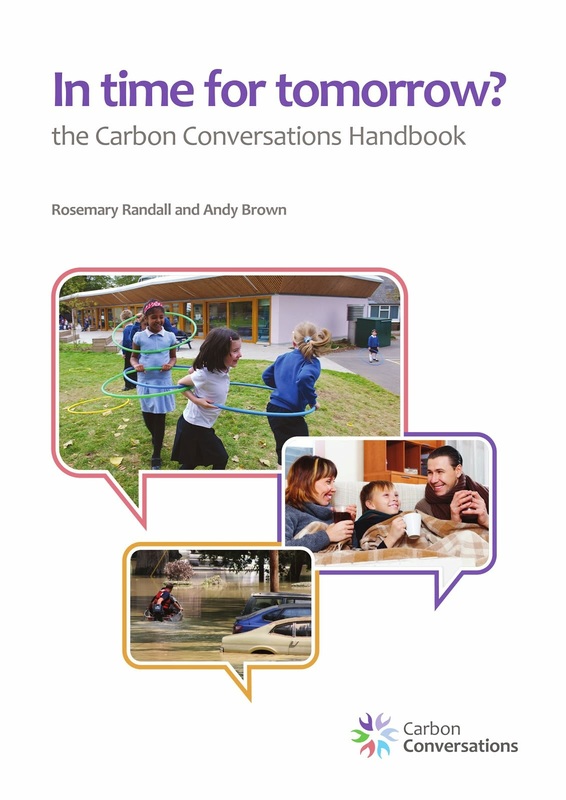 The previous edition of the Carbon Conversations Handbook took about 10 days work just to update with new research and further information available after just two years (2011-2013). I would think it best for people with local knowledge to work on the technical and practical changes. We can provide advice and in particular help with a local footprint calculator. Our calculator includes the embodied carbon in the food we eat, the stuff we buy and an allowance for 'infrastructure', which is the states’ emissions due to our taxes. Both the averages and the personal calculation are quite often greater than other organisations' figures. The groups are intended to work as support groups and have been developed drawing on psychoanalytical and group work theories. Groups need to be facilitated by experienced facilitators and to run a project you will need support form a someone engaged in professional therapeutic or group work practice. The Facilitators Guide includes information on setting up groups, our synthesis between the practical and the psychological, some custom designed activities for the groups and an explanation of the 'board games' that we devised to help explain some of the technical material. The participants Carbon Conversations Workbook has material for the custom activities and more advice about monitoring and targeting emissions. In the UK we have developed a practice that has worked well. We try to recruit group facilitators from participants of existing groups, and request that people wanting to train as facilitators have participated in a group first. We provide a two day training, which emphasizes the group work aspects of facilitating a Carbon Conversations group. We then suggest that new facilitators work with an experienced co-facilitator their first groups. (All groups are co-facilitated.) We also provide mentoring by group work professionals for volunteer facilitators. Where we have had enquiries from other countries, we have tried to ensure that there is the appropriate professional support and suggested that they start by running a pilot group to establish how the materials work in local context. Groups have been run in France and Australia and are being discussed in the USA and Canada. We look forward to hearing the outcomes of the groups and the facilitator’s thoughts on developing appropriate local materials.